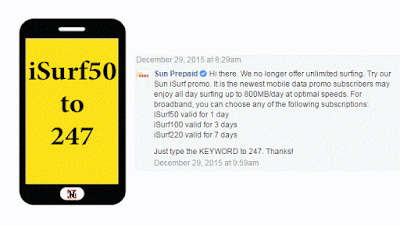 You can still register to Sun Cellular internet surfing even if their previous Unlisurf promo is no longer offer to all prepaid subscribers. As an alternative to unlimited browsing on your mobile, USB broadband and pocket WiFi, they offer iSurf Promos. Sad to hear that we can no longer experience the word ‘unli’ when it come to data plan on our telcos. Just like Smart’s Surfmax, this iSurf is also capped at 800MB daily at optimal speed but after you fully consumed the allocated data your connectivity may be affective and will be restored to usual speed after 12 midnight. If LTE is available on your location and you have LTE device + SIM card, try the new Sun LTE Internet Promos. Sun Cellular internet speed may vary on network type you acquired on your location or area. If you're only getting 'E' icon (EDGE) do expect slow speed. You can also change or switch to 3G/HSPA+ (H+ icon) by tweaking your phone settings that can be found in mobile networks options. You can also experience 4G/LTE speed if your area is covered with this kind of connectivity and you device (smartphone, pocket WiFi, USB broadband) is LTE capable. After texting the promo code, you will received a message that you’re iSurf promo registration is already active. You’ll be notified via SMS once you fully consumed your allocated daily data limit. This promo is available to Sun Broadband prepaid and postpaid subscribers, valid until April 30, 2016.